Paul Jorgensen drives to the basket during a game this season. Jorgensen and the Bulldogs will face Creighton on the road on Jan. 25. Jimmy Lafakis/Collegian file photo. All stats are through the St. John’s game on Jan. 19. Butler’s three losses to Georgetown, Seton Hall and Xavier to start Big East play were all games it lost last year. While it would be fair to argue that Butler should be winning those games, especially in a “down year” for the Big East, it’s not like Butler hasn’t struggled against these types of teams before. The schedule ahead is full of teams Butler has historically matched up with better. “We lost two in a row there and everyone wants to think the sky is falling and we won’t wake up the next morning, but we feel good,” senior guard Paul Jorgensen said. While coaches or players may never admit it, the Bulldogs have been pretty unlucky this year. According to kenpom.com, they rank 257th out of 353 teams in the country in terms of luck — “a measure of the deviation between a team’s actual winning percentage and what one would expect from its game-by-game efficiencies.” Eventually, that ball has to bounce Butler’s way. Butler is making more shots than its opponents. Basketball does not have to be an over-complicated game. If you put the ball in the hoop, you’ll likely win. It’s that’s not the case, teams can steal extra possessions by grabbing more rebounds and turning the ball over less than their opponents. In the DePaul and St. John’s games, the Bulldogs shot better from the field, better from three, assisted on more of their shots and has rebounded better than their opponent. Teams don’t lose often when they check all of those boxes. The only times Butler has failed to do shoot a higher percentage or take more shots than its opponent this year was at Florida and, ironically, a win over Ole Miss. Against DePaul and St. John’s, Butler did not get up as many shots due to turnovers but was able to control the glass and make more shots than their opponent. Against Seton Hall, they shot less efficiently than the Pirates. Against Xavier, it was the extra rebounds given up. And while some fans berate the team for not getting to the foul line, head coach LaVall Jordan doesn’t seem too hard-pressed. “If we get clean looks from three, sometimes that’s our best shot,” he said. If the Bulldogs are putting the ball in the basket or stealing extra possessions, they are going to have a fighting chance to win the game. Gordon Hayward had Shelvin Mack. Kelan Martin had Kamar Baldwin. And when Baldwin became the go-to guy for this team, there wasn’t an obvious second option. Would it be Jorgensen or McDermott? Redshirt sophomore center Joey Brunk made a case in the first few games, but Baldwin needed someone who was capable of scoring 20 points on any given night that he was off. Butler has seemingly found that scoring punch from sophomore guard Jordan Tucker. While it took a few games to get used to the speed of the game again, he has found that rhythm. In the two wins, he’s averaged 21.5 points and seven rebounds, while shooting a scorching 58 percent from three. While there’s only five on the court at a time, great teams are able to sub in players and not miss a beat. With the new lineup, the Bulldogs have been able to do just that. While seniors Jorgensen and Nate Fowler moved to the bench, that does not mean their roles are any less diminished. Since moving to the bench, Fowler and Jorgensen have played starter’s minutes, while Butler’s bench has outscored its opponents’ bench by over 17 points per game. When the second unit comes in, Fowler and Jorgensen are seasoned veterans who can provide a source of offense when the starting five needs a breather. While Fowler and Jorgensen haven’t been scoring the ball as they usually do — each scoring less than their average in the past two wins — they bring a veteran presence to the second unit. Winning teams run deep. Historically, Butler basketball players are the type to put their head down and work hard without any showboating or flash. That has changed. Players like Jorgensen and Tucker are players that can ignite energy in their team. “I know if I see a wide-open transition three, I’m taking it without hesitation,” Jorgensen said. This team loves to play for each other and there seems to be a pep in their step. Even though junior guard Henry Baddley missed the potential poster dunk against St. John’s, a player needs to have the confidence to even consider taking that chance. 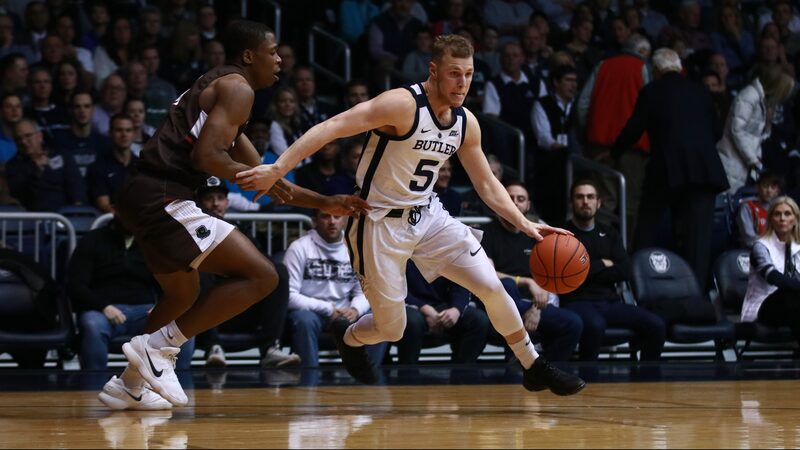 Butler has an attitude that hasn’t been seen in recent years, and they’ve used it to shoot 52 percent from the field and 45 percent from three in their past two wins. Agree there is room for optimism in my heart, and I won’t give up on this team, because I am a fan, and I believe in their upside. Time is running out and the losses are piling up.